With every new iteration of smart phone and tablet, a new generation of amateurs springs up to bounce roughly edited snippets of their lives off the nearest satellite or cell tower. While apps such as Vine have enabled tech newbies to produce 6-second gems of stop motion mediocrity, it hasn't stopped the bona fide artists and animators from getting their hands dirty to create frame-by-frame film gold, no smartphone required. One such artist, known for her penchant for sculpting creepy crawlies, murderous maidens, and gothic glam dolls, is Peoria native Glenda Rolle. Now hailing from sunny Orange County, Glenda is at it again; this time she's diving headfirst into the world of animation using her talent for visceral textures and darkly whimsical environments to invent worlds in motion featuring castaway sand babies, affectionate explosives, and a certain plucky raindrop. Glenda's proclivity towards mixed media art was firmly cemented at the age of 18 with her first exhibition at Peoria’s Phoenix Gallery. Since then Rolle has been on a roller coaster of success ranging from being featured in specialized publications like Dolls Magazine, solo gallery exhibits of two and three- dimensional pieces, to selling original jewelry designs via international chains such as Hot Topic and Spencer's Gifts. The path of creativity has many forks and detours, and along the way Rolle has learned a thing or two about being a successful artist. “Through the years I have come to realize that it is all about having fun in the process. If that becomes lost and too stressful then there is just no point,” says Rolle. 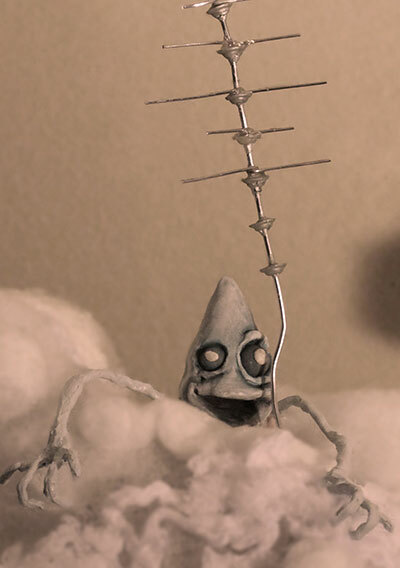 Rolle’s latest venture, an inspirational stop motion animation piece focusing on an ambitious little raindrop climbing the ladders to the highest clouds, nabbed first place at the Orange County Fair Film Festival with Squak Pattern Productions’ short film, Brainstorm. I had the unique opportunity to email her a few questions and get some insight into her process, influences, and how technology helps her succeed. What sparked your interest in stop motion animation? After about 10 years of making dolls and puppets and seeing them displayed in a stationary setting throughout stores and galleries... they needed to start moving! I wanted to see them walk across the shelves, yell at somebody, do a dance or something ...a different avenue with my art needed to happen. And now I'm exploring the aspects of film. How long does it take, roughly, from start to finish to create your stop motion shorts? Our latest creations (approx. 1 min. long) were quickly done in about 2 weeks apiece. That included the time it took me to create the puppets, mail all the props, animate, create the music and edit. I had a few deadlines and wanted to push them into festivals. The next big film that will be released at the end of this year is Rescued starring the Sand Baby Castaways. It is taking longer due to the details of the story. The short will be just shy of 10 minutes. The journey takes place underwater and there are new puppets and props being made for all of the scenes. Check out the teaser on YouTube under SquakPattern. What are your main influences when you design your characters? My work definitely has a style ...dark, grungy and slightly broken with a twist of cuteness. It has been compared to Tim Burton several times but as for influences I am a fan of Avant-garde films; Twilight Zone and Alfred Hitchcock. Usually a phrase or life happening sparks my imagination. I'm always questioning why something is the way it is or where did it come from. Most materials that I use have been found and collected. It might be a scrap of torn material, broken board or sand from the beach. I try to focus on the emotion of the character. How this character is going to feel during the animation. A lot is told through the eyes. Ray Harryhausen recently passed; he’s a pioneer of stop motion animation. Do you get any influence from him when you consider the technical aspects of your characters? Amazing fellow!!! J. (Osteo Parliament) came to Cali from Seattle to animate Brainstorm in my studio. As the clouds moved frame by frame from the right to left Ray Harryhausen passed. That was kinda strange and amazing at the same time. We were pulling all nighters drinking coffee and red bulls like mad... we were all cracked out, it seemed surreal when he died. How has technology allowed you to collaborate over long distances? The telephone is wonderful! LOL but even that...sometimes I would hear a robotic voice on the other end or my voice would repeat itself or we'd get disconnected for no reason ...this is frustrating! Especially when we are in the middle of brainstorming, shifting through the bad possibilities (we call them "3am ideas") and coming up with the best solutions for the film. The Internet has made it possible for my team to be apart and still create. It does get difficult during the editing phases but I am grateful for Dropbox and YouSendIt for allowing us to send large files back and forth. At times, these programs would have glitches and take several hours to complete depending on the server connection. Vine and Instagram give everyone with a smartphone the ability to create stop motion animation with just a push of a button. How do you feel about this and how will it influence your future works? I'm all about society creating! I don't think I could ever get hooked into that type of animation ...it almost seems like a video game. Teaming up with those companies and submitting my character, props and background designs would be rad though. I'd like to share my creations with others and have them enjoy the way they like to animate, even if it is a bit easier. How do you see your work with physical props and characters compared to today’s Hollywood animation (software-based, 3D modeling)? Personally, I enjoy the hands-on approach to stop motion animation and the overall look of the physical props and characters. I do like Dragonframe a lot! It shows you the frames captured so the next shot will line up in the perfect placement. Before software like this, one would have to guess. What made you decide to leave Peoria for the West Coast? I needed to find a job! At the time I was looking into prop work, toy businesses and Halloween companies. During my last semester of college at the University of Kansas I knew that I had to check out California and New York. So I lined up some interviews. It just so happened in the same week a few art pieces of mine that were in an exhibition sold so I had the funds to hit the road! Oh, how I love New York but there were more opportunities for me in California. I left the Midwest and headed for Cali with a promised Halloween freelance gig, Wolf (my bird) singing in the passenger seat and my car packed to the rim. I look back and laugh! That car was so damn full ...one of my shoes was pushed up against the window the whole way there and the sun had melted it directly onto the glass. My god! I had no idea where I was going to live or who I would meet... but I've been here since 2004 and this is home. Glenda Rolle’s artwork is internationally known and sold through a variety of retailers (Hot Topic, Spencer’s, Claire’s, Hastings, etc.). 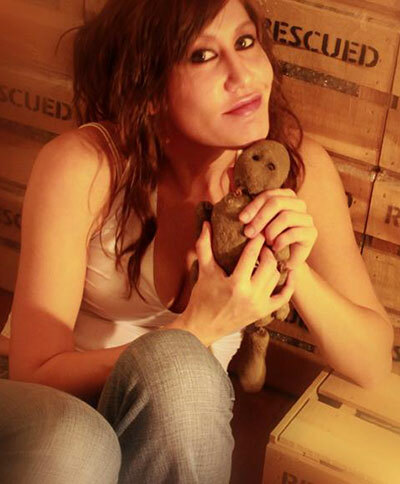 Her artwork has been showcased in many exhibits throughout the U.S. and has been featured in numerous magazines (Dolls, Doll Castle Magazine, Gothic Beauty, etc.). Find more of her work at GlendaRolle.com. Brainstorm has won 1st place in the Orange County Fair and will be screened August 9th at 12:30pm in the Hangar Building.